You might remember back in December when we revealed that as part of our growing marketing strategy for our client, St Martin’s School, CuCo were designing a brand new school prospectus. St Martin’s are a happy, family-owned independent preparatory school for boys and girls aged 4-11 years. Small class sizes lie at the core of the St Martin’s philosophy, helping teachers to celebrate the uniqueness of each child and to spend more one-to-one time with them. On average, 90% of pupils at St Martin’s reach the top 16% of the national ability range. A strong school prospectus goes a long way in really showing exactly what a school is all about – its facilities, its ethos, and what parents can expect their child to experience there. 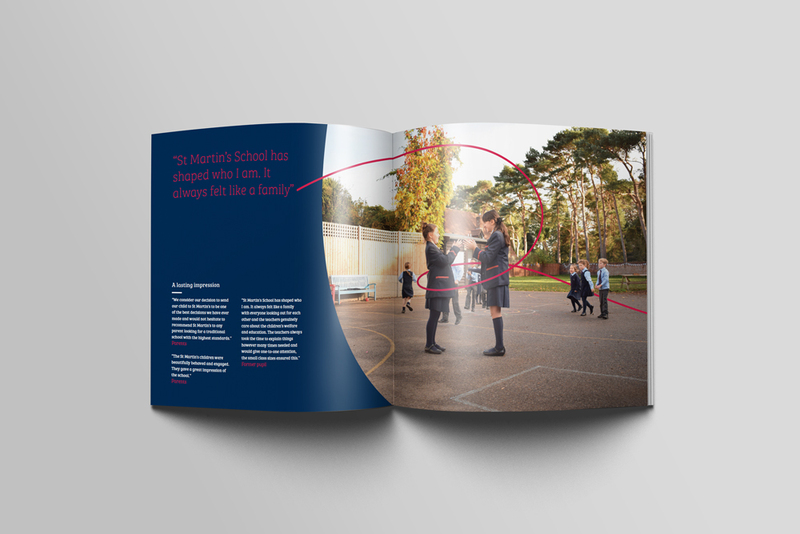 Therefore, our team made sure that every aspect of the prospectus – from the photography, to the design, to the copy – clearly communicates the family values and ethos of St Martin’s school. CuCo art directed and organised a photoshoot at the school, with our Creative Director Christian photographing the pupils within the school environment in order to reflect the homely and unique environment of the school. For the design, soft curves were used to give the prospectus a friendly look. A red line was used throughout the prospectus to represent the interaction between the school and the children and their journey through St. Martin’s school. The copy was written in a friendly and caring tone of voice to reflect the personality of St Martin’s and clearly educates parents about what they can expect from the school, including the small class sizes, their teaching methods, their caring environment and their wide range of extracurricular activities outside the classroom. St Martin’s school are extremely happy with the new brochures and have received very positive feedback. If you’re looking to refresh your school’s prospectus, we’d love to hear from you. Call us on 01202 911959 or email us on hello@cucocreative.co.uk – we’d love to help!